One of the most important things I will teach my children, is how to apologize the correct way. Many moons ago I read an article about the rules of apologies and it has paid off tremendously in my personal life, my professional life, and my parenting life. Following are my do’s and don’ts from the article and lessons I’ve learned along the way. Start with the obvious, the “apology” words. Use whatever is most appropriate… I’m sorry, I regret, I apologize, etc. Acknowledge what you did so the person receiving the apology KNOWS you KNOW what you did, not just that you’re saying sorry and moving on. When you acknowledge what you did, use the word I. This is about what you did. Show empathy and true regret for how your action effected another person. Note: Do not confuse or combine numbers 2 and 3. You do not want to say “I’m sorry I did this specific thing and YOU took it too personally.” That’s displacing blame onto the other person – not acknowledging what YOU did. Further demonstrate your true feelings by telling the person what you plan to do to prevent the same action from happening again. Seriously guys. THIS IS THE MOST IMPORTANT PART! A true apology does not include the word BUT. But is a word you use to get yourself off the hook or excuse your behavior. Using the word BUT pretty much wipes out any validity of number 2 and 3 above. YOU CAN TEACH THESE IDEAS TO YOUR CHILDREN and help them build the skill of apologizing. As a parent, don’t force apologies. They’ll mean nothing and be a waste of time. Do not tell your child to “go tell Lucy sorry for pinching her”. Forcing a child to give an apology sets the wrong example to your child and it pretty much makes the apology as ingenuine as can be. Think about it. If Jenny’s mom made her apologize to you after she threw gum in your hair, will you believe her? NO. Instead if your child did something that warrants an apology, ask your child what happened. Then ask your child how the other person might be feeling and why. Ask your child if s/he would like it if something like that was done to him/her. Then ask your child if there is anything s/he wants to say to the other person. If your child says no, well, you’re not alone, you have a stubborn one. So try again a little later. Your child might be still upset and might not be ready to apologize. That’s okay, even adults take some time to apologize. 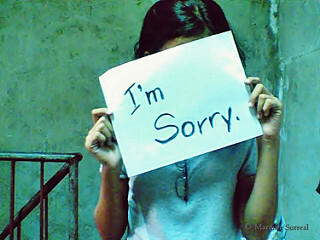 A genuine apology after the fact is much better than a required apology immediately following the encounter. Now if your child tells you yes, s/he does have something to tell the other person involved, let them do so in their own words. Don’t force an apology out of your child by making them repeat after you. They’re not robots. Don’t threaten your child by saying “If you don’t apologize to Scottie, you’re not playing on your tablet tonight” will get you an apology, but not a real one. I’ve certainly had to apologize hundreds of times in the years since I read the article. I sometimes struggle with remembering to include number 4, but I never ever use the word BUT. To consciously make sure I don’t say BUT. I go through the steps in my head. I may sound a little less conversational and a bit more choppy, but what I’m saying is authentic. One more thing to add…. even if you become the best apologizer there is, keep in mind you’re asking for forgiveness and someone might not be ready to give it yet. You’ll have to accept that. Real quick here’s sample of an apology I’d write to my boss BEFORE reading the article. I’m sorry the website went live and there was placeholder text on the homepage. I wanted to put a current special on the homepage but the client never gave us the information I requested three times. I sent an email and tried to call and he didn’t answer. Again, I apologize. OMG it was hard to write that because it’s sooooo terrible. There’s a ton of blame, a few excuses, the obligatory “I’m sorry” and “I apologize” so I don’t lose my job, but mostly wanting to let him know it’s not my fault. Here’s a better apology that takes the best practices of the article into account. I’m sorry the website went live and there was placeholder text on the homepage. I realize how important this client is and how this mistake reflects poorly on everyone who worked on the project. I understand your frustration and am just as embarrassed that the client brought the error to your attention. You told us this client was important and I should have done an extra check to make sure the website was perfect after I delegated the work to my team. I’ve added a new task to the project template to ensure another senior member of the team is reviewing the site before go live to ensure all placeholder text is replaced with client-specific copy. It’s not perfect, but you can see the difference. There’s meat to the apology. It’s not all fluff and synonyms for I’m sorry, I apologize. There’s no blame placed on others. There are no excuses. There are no long, drawn out explanations. To be frank, as a boss myself, I’m far more concerned with you acknowledging what happened, communicating to me that you understand the implications, and ensuring YOU are coming up with a solution to prevent this from happening again. I don’t usually need an explanation or all the details of who did or didn’t do what. What happened happened so fix it. And if your apology is genuine, you will find a way to ensure it doesn’t happen again. If you take one thing away from this blog post, make sure you remember “NO BUTS”. Here are some articles that share the same kind of ideas I’ve outlined above, if you’re interested in further reading.